Nuke 'Em 'Till 'They Glow!! is a cooperative effort, a concept that held true to a certain extent even when Ben was writing the primary story sequence as text-only fan fiction. He's never hesitated to admit that when people write feedback to him that has a funny line or scene in it, he's prone to incorporating it into the story with thanks to the originator. The graphic stories are even more so. They are the result of a team effort, with many people contributing to the end result. Ben writes the majority of the scripts for both comics, but he solicits ideas, advice and critiques from his brother, Danny; the artists, Esa and Chesu; the site host, Ammon; and me. The people who post in our forums also contribute, whether or not they realize it, and it tickles all of us on the creative side pink when the forums are busy. But Ben doesn't do all of the writing. In the sprite comics, "Filler Fridays" exist in large part as a chance for Chesu to express himself, and often he does his thing without input from the rest of us. Sometimes the rest of us also write filler or regular scripts of our own, even if it's only one panel's worth. There's also the way I earn my title around the site. I dubbed myself the "editor" because there really isn't another title that describes what I do very well. In addition to going over the extras Ben writes and cleaning up the spelling, punctuation and grammar, more often than not, I preread the scripts before they go to Chesu to get the artistic breath of life. During the critiquing process, I don't just say "that looks good and that looks bad", I make suggestions about how to make them better. Queen Serenity tumbles head over heels on the shockwave of the explosion, past the blasted-in entrance to Serena's room where Terra lay. She looks over and there's a gigantic twitching half-picked-clean dinosaur in the corner. The deflated metroid flops onto the ground nearby, twitching its tentacles. Terra's picked the dinosaur clean. Terra: Mmmm! That was great. (fork, knife, bib... faces the metroid, which is whimpering and trying to scoot away) Now time for dessert! Terra: No, no. You have to be a galactic destroyer for that to work. (stalks closer) Besides, they're more what we call... guidelines. UNHOLY SCREECH! SQUELCH! ROAR! SPLATTER!!! Guard 1(starts to take his helmet off): You know, I wonder what things would be like if we took out helmets off for just one--(sees Terra's actions) OH MY FUNKY JUJU BEANS!! I THINK I'M GONNA BE SICK!! Guard 2(alarmed): What? Did you see something? Guard 1(jams his helmet back on tight, running with his fellow guard in tow): No, and neither did you! Guard 1: THE HELMETS STAY ON!! Terra walks out behind them, totally delighted and chewing on one of the galactic metroid limbs. Slightly dazed by the explosion, Laios wakes up on top of Tsunami. Tsunami: You did great! Now go track down that monster and finish it off. Tsunami (^_^): Hmm. I wonder if he'll want to come back to Jurai with me when we finally get revenge on that stupid planet-destroying monster. Arby and Thalia have Princess Serenity cornered. Serena (crazed, red-eyed): I've been waiting for you! (head spins around, short ponytails flying) Mwehehehehe! Arby (looks at Serena): No, wait. She's possessed boie 'erself! Thalia (gasps, covers her mouth in shock): That's the worst kind! Arby: Roight. We shall 'ave tew employ drastic measures. Now, yew'z gots the droied 'shroom paste? Thalia (puts a jar onto the floor): Check. Arby: Mouldy Mush, Bramble Bushes, n' Boinary Badgers? Thalia (adds the items to the growing pile): Check, check, check! Arby: Now repeat the Mystic Phrase: (everyone joins in) Jollywugs n' Pollywugs did laugh along the way, m'anderin' th' squirrels were flolloping at bay. Fairly fealty fungus fuzz floiyin' for th' fleas, n' burbling badgers bakin' herbs fer tea. They wait and nothing happens. Serena (evil, but perplexed): Was that... supposed to do something to me? Arby: Nope! But sure makes ya look real silly! Thalia (small aside to Arby, practically non-visible): That was neat! I haven't done that since I was a schoolgirl! "It's a lot easier if you remember that there is no mallet." No point in commenting on this one since it's already been used. Or is he doing a Friday filler instead? If so, then first point is that "parlay" is a term used in betting. "Parley" means to discuss terms with an enemy. This has a major problem in that Terra's dialog is too cryptic. I've been a NETTG fan for years, have been editing the fan fiction story almost as long, and editing the comic strips since day one... and I have no idea what she means about "having to be a GD for that to work", or just what it is that are just guidelines. Please clarify this if it hasn't already been rendered. I'm of two minds about this. It's mildly amusing in itself, but it effectively closes off any chance of using the helmets as a running gag again. If you decide to go with it, then you'll ruin the joke for future panels. A better approach might be if QS and PS recover from the explosion and wander into the room where Terra is dismembering the Metroid. Having PS get sick seeing Terra eating would be in the best traditions of NETTG, and then you can have QS say something like "How sweet. Terra's back to her normal, perky self!" or something like that as the punch line. After PS gets royally sick (pun intended! ), she can run off in a berserk state, setting up the later sequence where Thalia and Arby find her. However, it's not clear how PS's lines fit this. I'm assuming that Thalia and Arby are the ones that chant, so why would it make PS look silly? Terra: No, no. We galactic destroyers have no such rules for discussion. (stalks closer) Even if we did, they'd be more of what we call... guidelines. Terra: You mean you want to plead for your life? Terra: Hmm... Well, you can go ahead and plead. While I eat, that is. Yeah, I kind of like this idea better. The guards are funnier when they can be properly, ignorantly aloof of things. There's all kinds of fighting going on inside the room where Terra's at, chunks of things, legs and squishy gobs flying out. 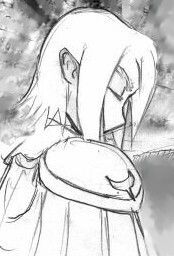 QS has found a weeping PS and is comforting her, walking in the direction of where Terra's at. QS: There, there, you'll be all right. PS: I'm sorry, Mother; I just don't know what got into me. QS: Let's take you back to your room--oh my, what's going on over there? PS (sees what's going on and is traumatized for life, wide-eyed, blanched): AAAAH! I THINK I'M GONNA BE SICK!!! QS: Oh, how sweet! Terra's back to her normal, perky self! Good point, good point... (checks it over....) Oh, that's easy to fix. They dress Serena up in all the items they've collected, making her look rather silly. They dress Serena up in all the items they had in store while doing the chant. Serena (fumes, burning off the attached items): Grr. Thanks for the comments, Larry! I had to think 'em over a bit before I lunged back into the mood. These scripts don't take long at all; it's just the feel has to be right to work on 'em properly. This is just what I had in mind. The second version you came up with lacks flavor. Oh, and the "par-lay" thing is a reference to the French word "parler", which means "to speak". It's a way of saying "can we talk this over? ", and is probably intended to add a period flavor to the movie. The problem arises from the fact that "parlay" is an actual word. The usual problem. You hit the punch line, and then keep going. That's fine when you're writing a story, but it's not good in a comic strip. Chop this off at "PS (runs off): BLEAGH!! ", and it's perfect. No punch line to this one. It's straight exposition. Do we want a joke for this, or was this intentional? It's a story chunk. A necessary link to move on to the next stage of the attack. So, no joke needed. Can't really think of one if we need one. Ah, okay. Well, Chesu made up the second version already, but I won't be able to post the page until later today anyway, so I'm having 'em switch the dialogue over to the first one. Okay, so we'll chop the script off there. As you can see, Ben starts out by roughing out a plotline several strips in advance, then he puts it online for the rest of us to look at and comment on. I do most of the criticism, but by no means all of it. The others also throw in their suggestions at times. After the scripts are ready, Chesu works his magic and puts images to it all. "Hmm… Well, what's there to say about me and Chesu? I write the script, he decides whether he likes or not, he puts it together and sends it to me, and I usually say, "Looks good!" and then I post it. The end result? That is to ask, what are we looking to get out of doing this? That's why we love it when you, the visitor, post in the forums. Those little comments about how much you enjoy the comics mean a lot to us, and knowing that we've brought a little touch of humor to your day makes it all worthwhile. …and yeah, the ego-boost doesn't hurt.